Sister Agnes Mary McLean passed away gently and peacefully on September 6, 2016 with several Sisters praying with her. Even in her last days in Maryknoll Sisters Home Care, she would respond with a smile of gratitude as Sisters and staff came to see her. Agnes Mary was 91 years old and had just celebrated her Jubilee of 70 years as a Maryknoll Sister this spring. Not long after profession, Agnes Mary was assigned to Japan in 1949. Her first years there were spent doing catechetical and pastoral work in various parishes in the Kyoto Diocese with the Maryknoll Fathers. She first went to the parish in Tsu, Mie Ken (Prefecture), then to the parish in Otsu, in Shiga Ken and later to the parish in Ise, Mie Ken. She especially enjoyed working with the women and children, who were attracted to her open and welcoming spirit. She was always eager to share the good news of Jesus’ love for them. A big change came to Agnes Mary after her first decennial in 1958 as she was assigned to the Maryknoll Cloister. However, she remained there for only a short period, after which she was assigned to the novitiate in Valley Park in 1961 to assist with the care of the postulants. Then another transition occurred in 1963, as she was assigned to the newly opened Maryknoll Girls’ School in Yokkaichi, Mie Ken, Japan. 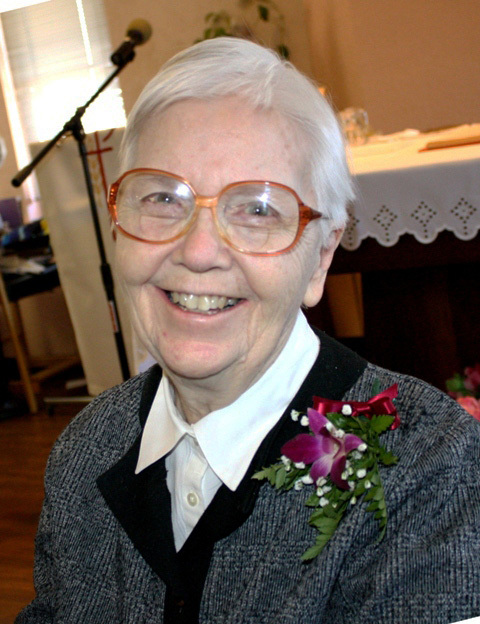 Teaching and working with students in various capacities was to be her main ministry for the next 40 years. However, during these years, Agnes Mary faced many health issues which required her return to the Center periodically for treatment. She also did family ministry for a period of time in the late 1970’s, taking care of her elderly mother. Over the years in Yokkaichi, Agnes Mary taught English as a Second Language to various levels of students both at Maryknoll Girls’ School and to other groups. She especially enjoyed her classes with university students at the National University in Tsu, where she did part-time teaching for many years. She also assisted in the English program at Kaisei High School, a Catholic boys’ school in Yokkaichi. Along with these commitments, she had private English classes at various companies in the area. As Yokkaichi was a port city, the need for international communication was very important. One of Agnes Mary’s special projects was helping students prepare for the numerous English speech contests that were held annually. Many of her students won local contests and some advanced to the national level. An especially memorable one was when one of their students won the prestigious Prince Takamatsu prize in Tokyo. As Maryknoll Girls’ School was originally situated in a somewhat rural area, driving the Sisters to the city for shopping, train connections, church services and other events became one of Agnes Mary’s duties. Sister Maria Rosa Nakayama, the principal at the school for many years, was often requested to attend educational meetings or speak at civic events and Agnes Mary was usually her loyal companion and driver. To the present day, Maryknoll Girls’ School has graduated a large number of students who have imbibed the Maryknoll Spirit. From time to time graduates of the school, who were taught by Agnes Mary, come to the Maryknoll Center. Their visits were a deep source of joy for her. After the Kyoto community house was closed in 2008, Agnes Mary and her long-time friend, Maria Rosa Nakayama, returned to the Center where they joined the Eden Community. Her prayer ministry was Japan, where she had spent so many happy and fruitful years. We would like to welcome some of Agnes Mary’s family members, especially her sister Agnes, who are with us today to celebrated the Liturgy of Christian Burial. We also welcome Maryknoll Father Ernest Lukaschek, who will preside at today’s liturgy.